I recently just found out that H&M has a lovely Home Collection. A bit late in discovering this, I know, but it was a good surprise. I was so surprised when I found out it was from H&M…. I never knew they also have a Home collection, like Zara Home or French Connection Home. After all H&M is a Scandinavian brand, so I must check that out! Last Sunday I was in the centre with my boyfriend for a quick shopping, before our visit to Ireland next week, and I didn’t miss the opportunity to drag him into and H&M shop. Did you know H&M Home? Did you buy any good thing there? How is the quality? Unfortunately, my short holiday is over. It felt quick but it’s great to disconnect from London life for a few days. I decided to share this lovely house that I stay at almost every year. It’s located on a little village north from Valencia on the Costa del Azhar. It’s a family house with all the typical Spanish characters and colours. The white walls are interrupted just by the green windows shutters and are surrounded by Pine trees and Mediterranean plants. The light feature in the photo below is just a pair of roof tiles mounted on the wall – A nice and simple detail using local materials to get a modern detail. 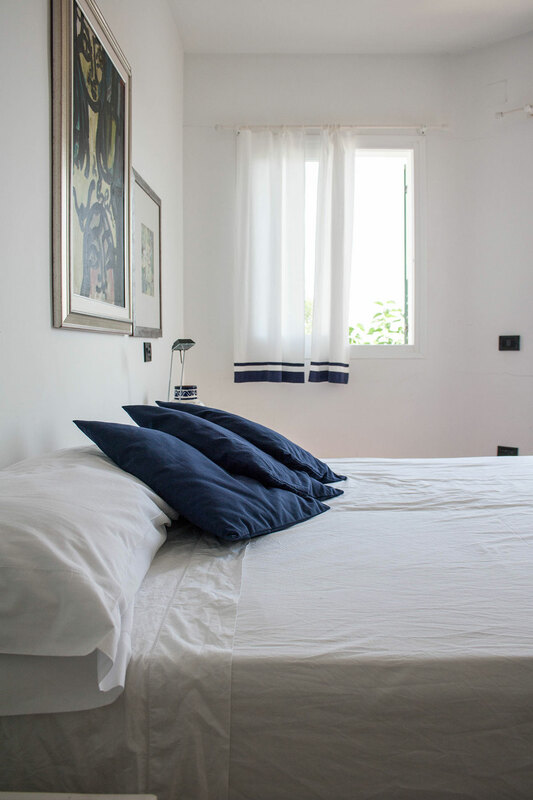 The Master Bedroom is on the top floor and has a lovely round terrace outside with a fantastic view of the see and the green trees from the garden and pool below. In front of the bed there’s this lovely niche with curvy lines. Blue vases are used to decorate this little space. The African wood sculpture was bought at a local market. The Bathroom is a triumph of Blue & White using local azulejos ceramic . One of the two double bedroom has got and entire wall decorated with hats. Its a great and simple idea, and also a cheap one! It’s also practical during long hot Spanish summer days. The rest of the bedroom is blue and white. The vase is from one of the local ceramic manufacturers. 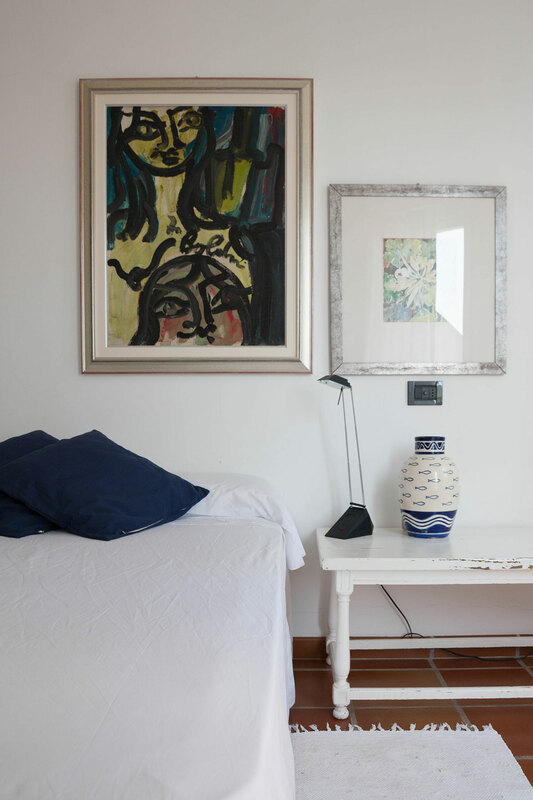 The sideboard and the bedside table are second-hand ones that had been restored and painted white by the owners. Hope you enjoyed this first set. It was nice to get back on my camera after a while and take some nice pictures of this house I love so much. I will post more in the next few days. Please leave me a comment, I’d love to hear what you think. I’m not sure if I’ve mentioned it but I do have a thing with black and white. I’m off to Spain next week and my brain is already in the Holiday Mood. I was looking online for holiday houses and I came across Casa1505 designed by one of my favourite Portuguese architects: Eduardo Souto de Moura. The House is located in Porto, can host up to 6 people and is available to rent “just” 775£ per week. I absolutely love this little window with the typical Portuguese pattern. He carefully mixes contemporary architecture with the traditional elements of the surrounding area. The simple staircase is incredible beautiful and pure, especially the first step made of marble, which is a trademark part of the architect’s style. The house consists of two separate volumes unified by interior gardens. The outdoor patio is perfect for an early morning breakfast, or late evening drink, when the sun is going down. The Driade Toy Chairs are just perfect for this space. The stone cream colour gives a very soft and nice atmosphere to the other bedroom, with en suite bathroom. I really like those simple Black line artwork on the wall. I wonder who the artist is? And finally the architect’s touch is also on the beautiful entrance and letterbox where the stainless steel is contrasting with the typical stone wall.